A work from an exhibition called Dog Paintings by Joel Cohen in the Mill Gallery, 2009. HMAP organizes different kinds of events and activities in the Mill Gallery. Individual exhibitions of sculpture, paintings, prints, ceramics, quilts, and other works of art generally run from April through October approximately monthly. Artists interested in exibiting their work in the Mill Gallery may contact the HMAP staff. Members who wish to show their work are granted preference in selecting work for solo shows. Large-scale works can be accommodated on the grounds around the mill. Exhibitions at locations outside the mill property include the organization's Annual Road Show held along Md. Rt. 355, the main street that runs through the town of Hyattstown. This show is held in cooperation with the residents of the town and Friends of Historic Hyattstown. HMAP members are invited to participate in a membership exhibition each year held in the mill, or when outside venues can be arranged, places such as the nearby BlackRock Center for the Arts in Germantown, MD. 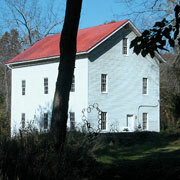 In 2004, supported by a grant from the Montgomery County Historic Preservation Commission, HMAP organized and exhibited in the Mill Gallery, "Lost Montgomery," a collection of 44 photographs of historic sites in Montgomery County by Michael F. Dwyer and orchestrated its showing at additional locations including Waters House, managed by the Montgomery County Historical Society in Germantown, MD, and the Maryland National Capital Park and Planning Commission Facility in Silver Spring, MD. Selected photographs from the exhibition are on permanent display at the Montgomery County Agricultural Reserve Farm Park Visitor Center in Derwood, MD. A second permanent exhibition curated by HMAP that focuses on Montgomery County properties is at the Mid-Atlantic Federal Credit Union in Germantown, MD.